"He didn't move. He didn't make a sound." 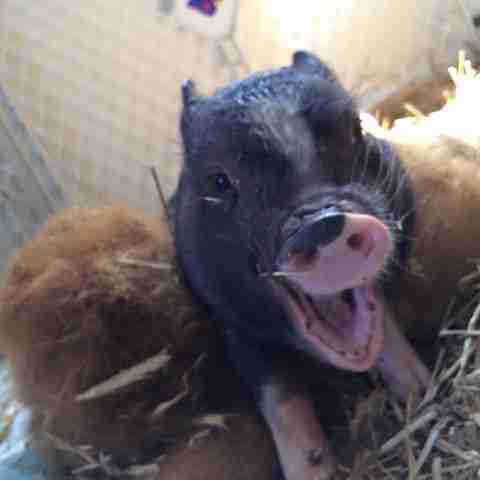 He wasn't quite dead, but the tiny pig slumped in the corner of a New Jersey barn had fooled a lot of people into thinking so. At just 10 days old, he had been dumped there there like trash. Unable to stand on his own feet. Likely wracked by meningitis. Riddled with parasites. 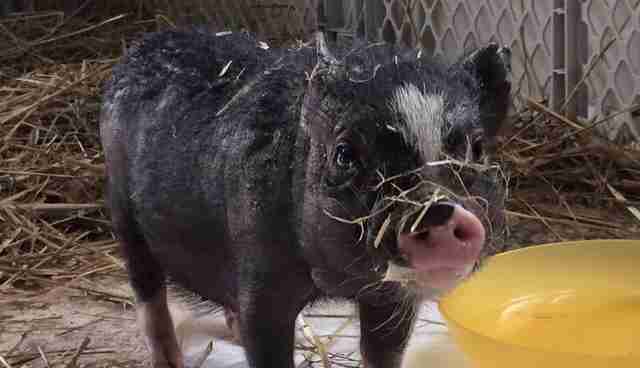 This pig seemed well on his way to better place when a rescuer from New Jersey sanctuary called Rancho Relaxo found him. The pig, who was named Rocky, would indeed go to a better place. Just not the place everyone expected. Rancho Relaxo didn't have room for Rocky. So the group got in touch with another New Jersey rescue, Ahimsa Acres Sanctuary. Staff from there rushed to pick up Rocky and take him to the University of Pennsylvania's New Bolton Center Hospital. "He was so bad, that I didn't think he'd survive the hour and a half car ride to New Bolton," Jena Mazzio, founder of Ahimsa Acres Sanctuary, tells The Dodo. "He didn't move. He didn't make a sound. The only way I could tell he was still alive was by the blinking of his eyes." Once Rocky reached the hospital, doctors were even less optimistic. 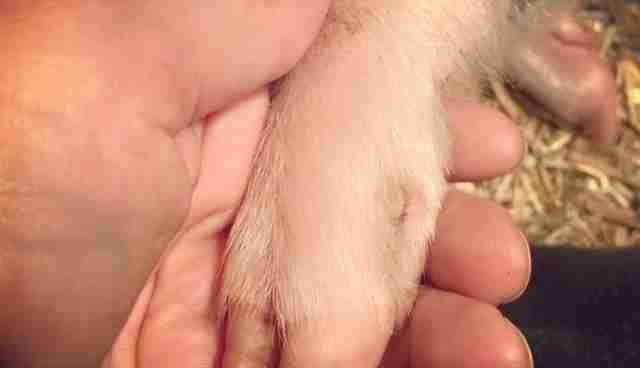 Staff had a hard time finding blood to extract and test - pigs are notoriously difficult to get blood from. They could only speculate he suffered from meningitis and pneumonia. Vets said he had around a 5 percent chance of living. "We were faced with the hardest decision," Mazzio recalls. 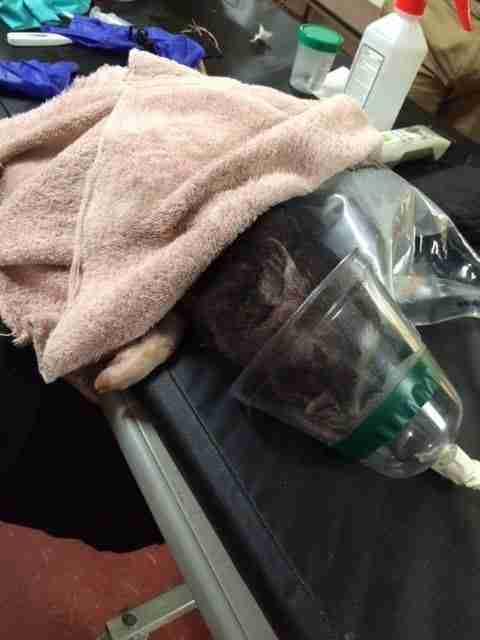 "Continue treating an undiagnosed illness or humanely euthanize Rocky. "We asked Rocky's doctors to try everything they could. We weren't ready to give up yet." Neither it seemed was Rocky, who got his name from famous fictional boxer Rocky Balboa "for his fighting spirit." In the days that followed, Rocky's condition would get so grim even his rescuers were beginning to lose hope. But round after round, the tiny pig kept battling. On the 17th day, Mazzio got a call from the hospital. Rocky was on his feet. He was ready to come home - his first real home, at Ahimsa Acres. 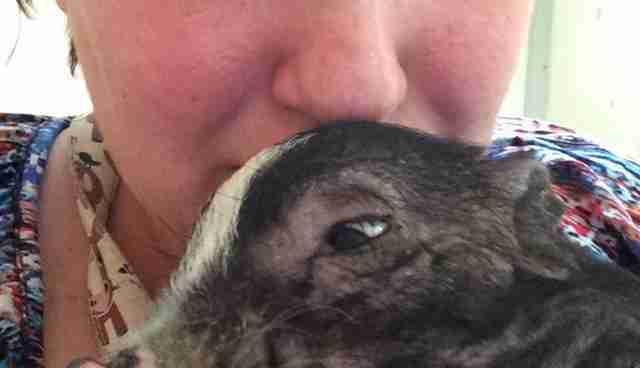 It turned out, for a pig like Rocky, there's a lot of wriggle room in a 5 percent chance to live. It's only been a couple of months since Rocky was a throwaway pig who had to blink to let people know he was alive. Since then, he's found so many other ways to let people know he's very much alive. "Rocky is an adorable, spunky, stubborn, smart little guy and amazes us each day with his progress," Mazzio says. 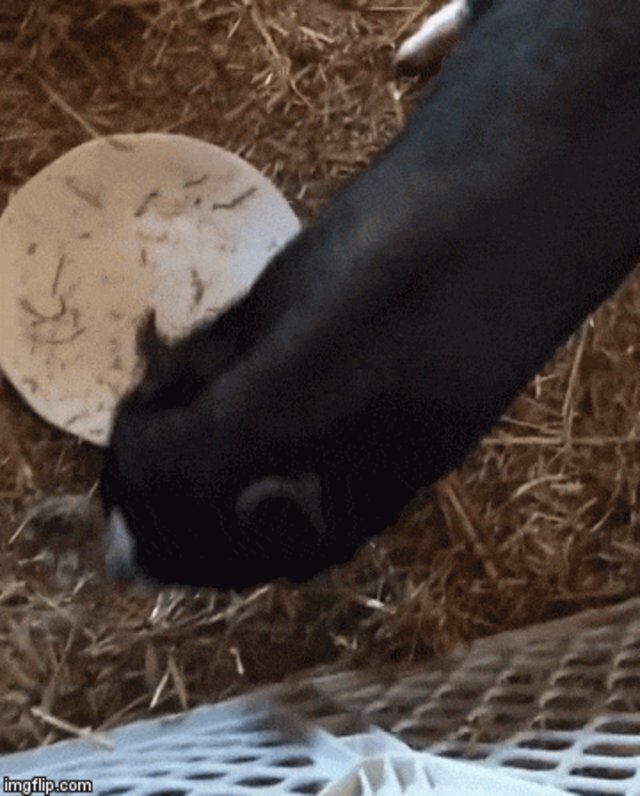 Today, the pig whose life was so close to being over in the blink of an eye, lights up the sanctuary he shares with horses, rabbits, chickens, ducks, sheep and other pigs. 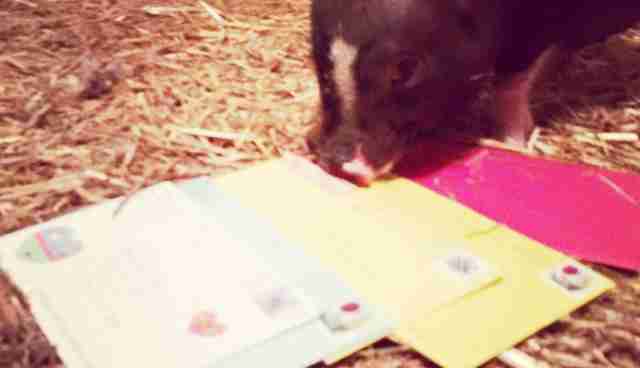 He's also a social media darling with his own Facebook page - and more fan mail than one pig could ever read. "Our hope is that Rocky helps people to see animals in a different light - to see them as beings instead of just 'things," Mazzio says. No, Rocky was never a thing. 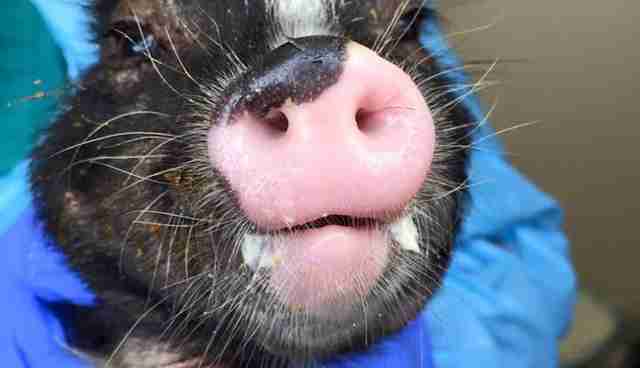 In fact, as his new nickname suggests, he's Rocky the Miracle Pig. He has an irrepressible appetite for life and, well, food. You can support Rocky and the animals who call Ahimsa Acres Sanctuary home by making a donation here.